This horse has one copy of the frame (LWOS) mutation. Horses with two copies are not viable. In the previous post I talked about how the physical location of a mutation can limit the possible pattern combination. There is another potential limitation, which is viability of the organism. Those of us that like horse colors, particularly the white patterns, are accustomed to thinking of colors as something that is added to what would otherwise be a horse of ordinary coloring. So the horse above has white markings on his body in addition to his chestnut coloring. That is certainly how a lot of artists would approach painting such a horse. But from a genetic standpoint, that’s not what has happened. Generally speaking, white patterns result when one of the genes involved in pigmentation is impaired. Something prevents the normal function of the gene, and as a result pigment is not distributed in the normal fashion. That is what we see most clearly, because changes to coloration are really obvious. But those same genes do not just regulate color, and those other functions may be effected as well. Hampering coloration is largely cosmetic, but altering the function of the gene can have more serious implications. That’s why horses with two copies of the frame mutation are not viable. 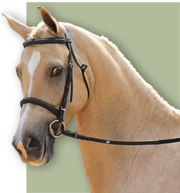 With just one impaired gene, the horse is not completely pigmented (ie., it has white patches) but is still functional. The horse still has one non-mutated copy of EDNRB, the gene involved with the frame pattern. It can “pick up the slack” for the necessary functions that gene performs. When the horse inherits two copies of the mutation, there is no backup and the gene cannot perform its function in the development of the embryo. In this particular case, no pigmentation occurs, which is why the resulting foals are white, but more importantly the colon is incomplete which means the foal cannot survive. Lethal White Syndrome is probably one of the best known problems with color because it involves the heartbreak of a live birth of a foal that must be humanely euthanized. Other colors, most notably the various forms of Dominant White, are also thought to be lethal when homozygous. Like the frame mutation, two copies impair the function of the gene to the point that the embryo is no longer viable. The difference between Dominant White and Frame Overo is that the embryo is lost early enough that no foal is born. This may explain why programs centered around breeding white-born horses in the seventeenth and eighteenth century were often plagued by infertility issues. In the past, before tests were available, lethal conditions like this were determined by analyzing production numbers. If the ratio of mutated to non-mutated offspring was off, and if true-breeding individuals could not be found, the trait was suspected of being lethal when homozygous. That was why roan was assumed to be a homozygous lethal for so long. Initial studies of production records showed that the ratios of mutated offspring were like those of a homozygous lethal, rather than a simple dominant. Proven homozygous roan stallions have since been identified, so it is clear that two roan genes are not always lethal, at the very least. So what does this have to do with the KIT mutations? In the comments section, there was speculation of the last post about whether or not mutations could crossover, resulting in a single gene with two separate mutations, rather than two separate genes with one mutation on each. Not asked, but an equally valid question, is whether or not a gene that already contained a known mutation could mutate again. If either were to happen, the next question would be: could the situation result in a viable embryo? Would the added layer of impairment change the coloring, or would it damage or even destroy the organism? Have we not yet seen a horse with three copies of some of these patterns because the statistical chances are infinitesimally small, or because the function of some gene is too compromised to result in a viable embryo? For those involved in hypothetical situations of this sort – like artists or simulation game developers – that is another aspect of color genetics that has to be considered. I am often amused by horse books – often those about colored horses – that point to old art work as proof that this or that color has a long history. Perhaps because I am an artist working in a field where success is often measured by the accuracy with which color can be rendered, I am all too familiar with how this can go wrong. 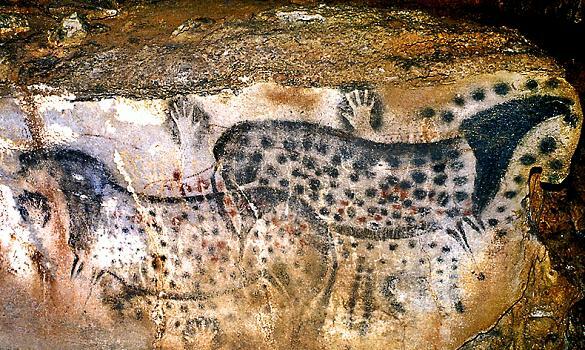 It is a lot easier to be sure that the Pech Merle cave paintings portray appaloosas when you haven’t looked at many artist’s first attempts at painting a dapple grey! I thought of this again when I was in Germany and came upon these illustrations from a 13th century book of love poetry. Why such pictures were hanging in the Medieval Torture Museum, right along with the comfy chair, I cannot guess! I suspect that the artists intended to depict dapple greys with most of these polka-dotted horses. Certainly that seems the most logical explanation for the blue ones at least. Just what the yellow ochre pony with the white dots is supposed to be is open to speculation. Is he a dappled palomino? Some kind of brownish horse turning grey? Or were dapples the crazy all those centuries ago, just as they once were with equine collectibles, so that they were added to just about any body color whenever the horse needed to be made more special? Were there thirteenth century equine art fans bemoaning the fact that the illuminators just couldn’t leave a plain color alone? Maybe that could explain the white dots on the very red horse in the background of this illustration, as well as those on the gray (mostly covered with trappings) and the taupe pony. These pictures illustrate the problem with using art to assess horse color in distant times. Our modern perspective makes it tempting to say that the taupe pony is evidence that silver dapple must have existed in Germany at the time. It is a color we associate with ponies, and he does look small relative to his rider. Unlike the other horse in the same series, he is taupe and not golden brown. Yet he matches the brown on the ground, just as the previous one matches the falcons. It might mean nothing. Likewise the size of the rider relative to the horse might not be intentional, or might be used to indicate something other than the size of his mount. We can only guess. All artists take liberties, and most are influenced by the conventions adopted by their colleagues. This can skew an entire era of work in such a way that it distorts reality. (When it was still published, The Boat has a wonderful set of articles on painting conventions prevalent in equine collectibles. Excerpts can be seen here, here and here.) A good example of this in historical equine art is the seventeenth and eighteenth century depiction of horse form. Yet even when horse color is rendered with such precision, it can be hard to know what liberties were taken – or what gaps in knowledge had to be filled in. That brings us back to yesterday’s post on the Royal Creams. Artists frequently painted the Creams. A print of this one hangs in the foyer of my home. Adonis is usually referred to as a Hanover White, which were bred alongside the Creams in the early days of the Royal Stud. In the painting he has blue-green eyes. Was that accurate? Part of why the nature of the dilution carried by the Creams has remained a mystery is that there are so many conflicting stories about their eye color, so the eye color on a horse like Adonis is particularly interesting. Did the artist know the eye color? The painting was made six years after the death of his owner, King George III, so it is possible that he was only working from descriptions. Maybe the color wasn’t important to anyone, and the artist just liked how the blue picked up the tones in the background. Is that why this Cream, another stallion owned by King George III, has golden eyes? Certainly the artist took liberties with the size of the eyes, as many artists did at the time. Could he have done the same with the color? As much as I love historical artwork, and find myself searching it for clues about historical colors, it is not an absolutely reliable witness. I had noticed this about dogs many times in the past, and finally got the chance to snap a good example. One of the first things we stress to beginning horse artists is that the white patterns overlay the body color. The shading does not follow the outline of the spots. Pixel artists even have a name for this kind of artistic error, where the outer edges of a shape are dark and the center is light. It is called “pillow shading“. Yet for some reason, sable shading in dogs often does exactly that; it concentrates along the edges of the colored patches. Notice the dark area along the topline of the Whippet above. Sable often does that, but look at how it travels down the edge of the two hindquarter spots. Just so it’s clear that the sable shading didn’t just happen to darken at the hip there, here is the other side of the same dog. Here the white occurs a good distance forward, yet the same dark edging is visible on the border. Using Photoshop to remove the white patch and recreate the dark area underneath, it’s even more obvious that the dark area would be oddly placed were it not related to the white patterning. I have no idea why black shading behaves like this in dogs but not horses, but it does go to show that artists have to look for these kinds of details if they want to capture animal coloring accurately.